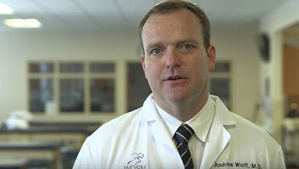 Andrew Wolff is a renowned orthopedic surgeon specializing in the treatment of athletic hip injuries. Patients from around the world seek his expertise in hip arthroscopy including labral repair and reconstruction, and correction of femoroacetabular impingement (FAI). Dr. Wolff understood how important being able to squat, run, and Olympic lift was to me as a crossfit coach. It is now six months after my surgery and I am back at the gym totally pain-free. 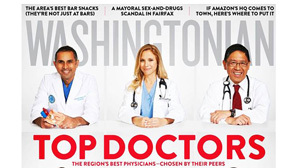 If you are having hip problems and live in the DC area, there is no one better than Dr. Wolff! Dr. Wolff saved my life. I tore the hip labrum in both of my hips, as well as the ligament teres that connects the femur to the hip socket. At my lowest, I was afraid I would live the rest of my life in excruciating pain. I could no longer walk without help. 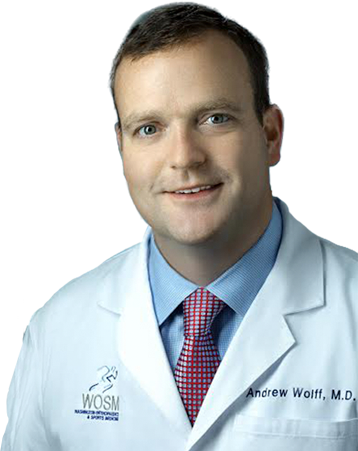 Dr. Wolff performed two surgeries. The relief was INSTANTANEOUS. Truly unbelievable. Dr. Wolff diagnosed a hip labral tear with cam impingement. I decided to go ahead with the surgery. Eight months later I climbed Mt. Aconcagua (23,000 ft.)! I am ready now to start training for a marathon. Dr. Wolff has been superb. He has great attention to detail, listened to my every need and answered every question during our visits. His staff has been outstanding. I would highly recommend him. While playing ice hockey for the University of Maryland, I suffered a hip check to my left hip. Over the next 10 months I saw multiple doctors who misdiagnosed my injury 3 times. Dr. Wolff and was able to immediately tell me that I tore at least 3 cm of the labrum in my left hip. Dr. Wolff performed surgery. Although I missed the entire 2013-2014 season, I have started every game in 2014-2015 and have no pain whatsoever. Today I hiked 16 miles on the Appalachian trail, not bad for a 55-year-old, but even more remarkable given I was experiencing agonizing pain in my left hip 7 months earlier. I had a torn labrum and was prescribed PT. My PT had just been to a lecture given by Dr Wolff and thought that I may be a candidate for arthroscopic hip surgery. I had the surgery a month or so later. In 7 months I was back to doing everything I wanted to. I had left hip arthroscopy done by Dr. Wolff 2 weeks ago to repair a labral tear. Aside from being a great surgeon he took time to answer all my questions and concerns, and he was very open and honest about what the surgery could do. His assistant Alex was a great help in setting everything up prior to my surgery. I highly recommend Dr. Wolff for this or any other procedure. As a lifelong athlete I have been hard on my body. After learning in 2011 I had a right labral tear in my hip, I met with several doctors. Finally I found the doctor who had the expertise to help me. I immediately felt comfortable with Dr. Wolff as he has a wonderful mannerism. Words cannot express my gratitude to him for getting me back in the game! As a professional boxer, I know that the smallest injury can mean the difference between winning and losing. Dr. Wolff has been a major factor in keeping me healthy in my march toward a world title. I started having pain and loss of range of motion in my left hip. Dr. Wolff was great, he listened to what I had to say and asked me a lot of questions about how I felt. He immediately made me feel more like a friend than a patient. He didn’t just race to the operating table; we tried conservative therapy and injections. Ultimately I did need a surgical repair. Now I’m back to my normal activities and pain-free.